There are lots of myths out there about what’s in non-alcoholic beer. A common one is that alcohol-free beers must contain special ingredients to help them mimic the taste, aroma, appearance and body of regular beer. Another is that alcohol-free beer always contains more sugar than its full-strength equivalent. The reality is that alcohol-free beer uses the same ingredients found in standard beer. It’s just that brewers sometimes use them differently to achieve the beer they want. And while some non-alcoholic beers are high in sugar, there are also many that are low in sugar – again, much like a standard beer. So what exactly is in alcohol-free beer? Let’s take a detailed look at the ingredients brewers use to produce alcohol-free beer and see how these affect its nutritional make up including carbohydrates, sugar, calories, vitamins and minerals. And, as all beers are different, we’ll also look at what producers need to put on the label so you can know what’s gone into the non-alcoholic beer you’re drinking. In the EU, most beverages under 1.2% ABV (alcohol by volume) must include the ingredients on the label. So, while producers of full-strength beers can keep you in the dark about the ingredients they use, producers of low and no alcohol drinks can’t. In other regions such as the US, producers don’t have to list the ingredients on the label. However, many do voluntarily, either on packaging or on their websites. These are the some of the most common ingredients used in alcoholic and non-alcoholic beer. Almost all beer is made from these four ingredients – water, grain, yeast and hops. Non-alcoholic beer is no different, although it’s possible to make beer-flavoured drinks without using some of these ingredients. Any beers made to the German beer purity law (the Reinheitsgebot) can only include these four ingredients and must only use barley or wheat grain. Water is the main ingredient in beer, making up the majority of what’s in your glass. The mineral properties of the water the brewer uses has an effect on the characteristics of the finished beer and different types of water are suited to different types of beer. This is why breweries traditionally focused on brewing styles suited to the local water – stout in Dublin, pale ale in Burton-on-Trent, pale lagers in Pilsen and so on. Nowadays, most brewers treat their water with minerals and salts to achieve the desired water type. They add these beforehand, so they won’t be included on your beer’s ingredients list and are allowed under the German purity law. 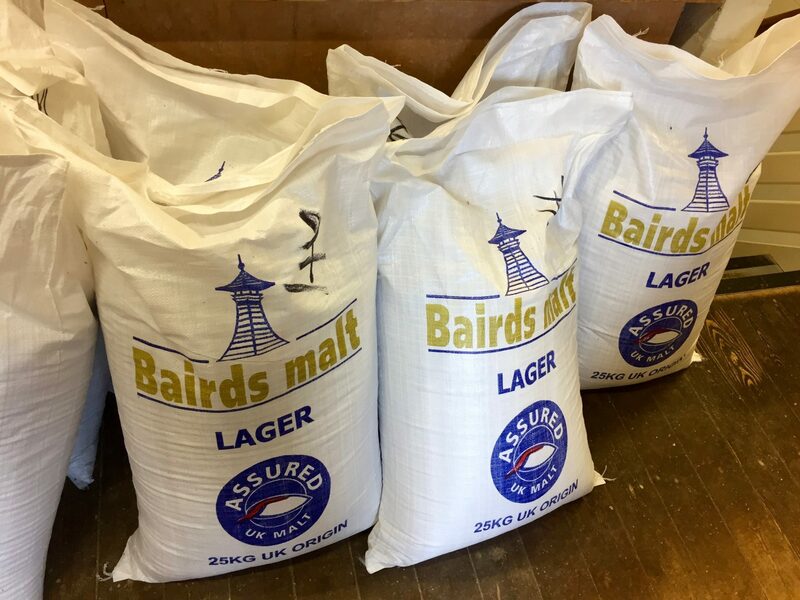 Most beers are made with malted barley, which produces sugars during the early stages of the brewing process. Yeast (see below) transforms many of these sugars into alcohol and carbon dioxide during fermentation. Some of these sugars end up in the finished beer. The malt and other grains also affect a beer’s flavour, appearance and body. Other grains commonly used in beer – usually alongside barley malt – are wheat, oats, rye, maize and rice. All grains will be included on any ingredients list and highlighted as allergens when required. Some brewers use malt extract. This is a concentrated version of the liquid created in the early stages of the brewing process. Malt extract is usually listed in the ingredients where used. Yeast is what turns the fermentable sugars provided by the grains into alcohol. When it works on the sugars, it also produces carbon dioxide and other compounds that affect the flavour and aroma. So, is there yeast in alcohol-free beer? Most brewers list yeast on the ingredients but some don’t when they filter it out of the finished product. Hops give beer its bitterness and affect its aroma and flavour. They’re also a natural preservative. 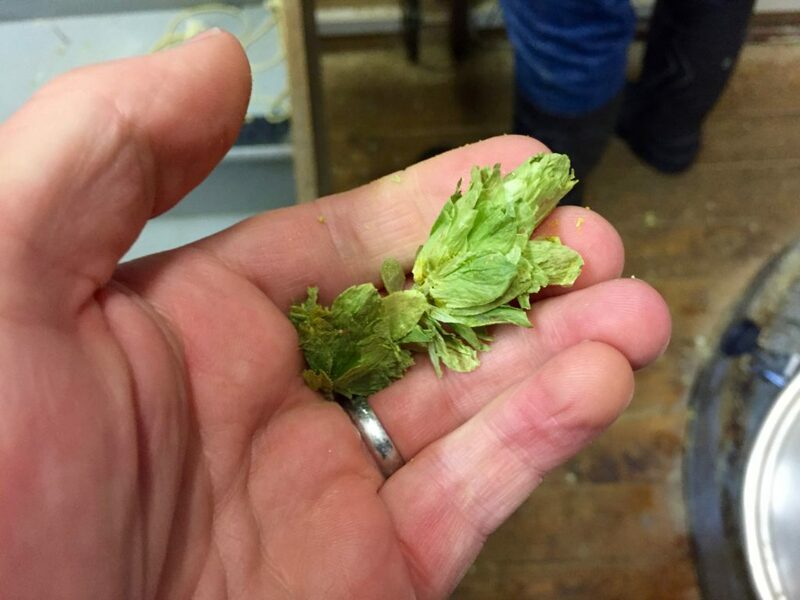 Hops added to beer come in three formats – dried leaves, pellets and oil (also known as hop extract). Producers don’t usually distinguish between dried leaves and pellets when listing the ingredients. But they tend to mention when they’ve used hop oil. Now we’ve looked at the ingredients that almost every beer includes, here are some other ingredients you might be consuming when you drink alcohol-free beer. Some are nice, some not so nice. So it’s worth taking a look at the ingredients list before you crack it open. Lactose is a sugar derived from milk. So beers with lactose aren’t suitable for vegans. Brewers add lactose to give beer sweetness because the yeast won’t consume these sugars during fermentation. They also use it to give beer more body, hence why it’s a popular ingredient in low and no alcohol beers, which tend to be thinner than full-strength beers. Lactose will be highlighted as an allergen on any ingredients list. Carbon dioxide gives beer its fizz. It’s a natural product of fermentation but many brewers add additional carbon dioxide before packaging their beers. Some producers include carbon dioxide on the list of ingredients when they’ve added it. Some use carbon dioxide they’ve collected throughout the brewing process so they don’t have to declare it as an additional ingredient. You can’t make a fruit beer without adding some fruit. Lactobacillus is bacteria that turns sugar into lactic acid. It gives sour beers their tart aroma and flavour. All “natural” means here is that it came from a natural source. But there’s often nothing natural about the way natural flavourings are processed. Natural flavourings are a mystical ingredient. They’ll be included on the list of ingredients but producers don’t usually have to specify the source of the flavouring unless you’d recognise its flavour in the taste or smell of the beer. A few producers add colouring to their beer to enhance its appearance. Most often, this is caramel colouring, which is the same colouring used in cola and many other foods including some sauces, pet foods and vinegars. Caramel colouring will be included in the ingredients list where used. Its “E” number is usually E150. Occasionally, brewers add extra sugar to their beers as a sweetener or to aid fermentation. Corn syrup is made from maize starch. It’s used as a thickener or sweetener in many foods and is a cheaper alternative to other forms of sugar. Corn syrups is rarely used in the UK and other regions. But it’s common ingredient in US foods and may still be in some American beers despite its poor reputation. Beer is a natural source of many vitamins and minerals including folic acid, fibre and potassium. In an effort to build on this and market their alcohol-free beers as a health drink, some producers also add vitamin C (sometimes listed as ascorbic acid on the ingredients) to their beers. Now that we’ve looked at the common ingredients in non-alcoholic beer, let’s see how those ingredients affect its nutritional content. In the EU, pre-packaged food and drink needs to show information about the energy value and six nutrients – carbohydrates, sugar, fat, saturates, protein and salt – on the label (but small producers are exempt). There’s no requirement for producers to show nutritional information in the US. There’s no fat in beer. But it does have carbohydrates, some of which is sugar left over after fermentation. Alcohol-free beers aren’t always low in carbs and sugar as it depends on the grains used and the brewing process. For instance, beers that use a yeast designed to consume less sugar will have more sugar in the finished product. However, alcohol-free beers are almost always lower in sugar than non-alcoholic alternatives such as fruit juice, cola and squash. Alcohol contains 56 calories per unit, so alcohol-free beers are always lower in calories than their full-strength equivalent. The number of calories in an alcohol-free beer will again depend on the type of grain used and the brewing process. Pale beers tend to be lower in calories while wheat beers and darker beers tend to be higher. Alcohol-free beer typically contains from 0.1g to 2g of protein per 100ml. Unfiltered beers tend to be higher in protein. It also contains polyphenols, which contain antioxidants and have various health benefits. Have you come across any other ingredients in alcohol-free beer? Is there anything else good or bad in non-alcoholic beer that’s worth a mention? Leave a comment below or get in touch on Twitter or Facebook.